Google recently announced a new program called Shopping Actions which will enable a Universal Shopping cart across Google properties where retailers can sell their products directly in the Google SERP, within Google Assistant results on mobile/voice, and across Google Express. Once a sale is completed through this listing, retailers will pay a percentage of the sale transaction similar to how brands pay Amazon a portion for each unit sold. It’s a strong move on Google’s part to mitigate losing data for the millions of product searches that begin on a search engine yet end up as a conversion within the walled garden of Amazon. By returning point-of-sale conversions to Google properties, Google will be able to further enhance its compelling Analytics 360 and Google Attribution products. Google Shopping Actions removes friction for consumers from the previously fragmented purchase funnel that existed across Google search, retailer sites and the majority of online purchases that occur on Amazon. This feature will also bring enhanced shopping experiences and greater inventory selection to voice shopping on Google Assistant. As consumers adapt their purchase behaviors, this feature moves Google one step closer to mirroring the convenient and reliable shopping experience that has made Amazon so pervasive. Shopping Actions will include familiar Amazon features such as instant check out, 1-Click re-ordering and integration with Google Wallet. Google is working to create a true omni-channel experience for consumers with its universal cart. Google has created the opportunity for consumers to seamlessly make purchases across retailers, platforms and devices with a single shopping cart and instant checkout. Universal checkouts have been attempted in multiple formats, but none have been overly successful to date. With Google’s reach and the backing of several large retailers, Google’s universal cart may be positioned to have staying power. In addition, consumers can now also benefit from linking their retailer loyalty accounts to Google Express, allowing for 1-click re-ordering and personalized recommendations, further removing friction from the online buying process. Linking retailer loyalty accounts to Google Express will create a more seamless experience in the long run, but upfront it will still require manual work from the consumer to aggregate loyalty programs from multiple retailers. With the new Pay Per Sale pricing model, retailers only have to pay when a consumer completes a purchase, a step up from the previous ad model of paying for consumer engagement and potentially losing the point of sale to another eCommerce marketplace (i.e. Amazon). As Google increases Google Express exposure on the SERP, partner retailers will be able to intercept consumers who would typically click through to purchase products on Amazon. With the new seamless shopping experience, competitive with Amazon’s Prime, it will be easier for retailers to convert shoppers, versus losing the sale to Amazon. CPGs, Manufacturers and OEMs may benefit from this new feature more than resellers or department stores. Now, when these brands sell direct-to consumer on Amazon, the products will extend into Google search and shopping. Increased opportunities on Google Express are beneficial in the defense against Amazon. 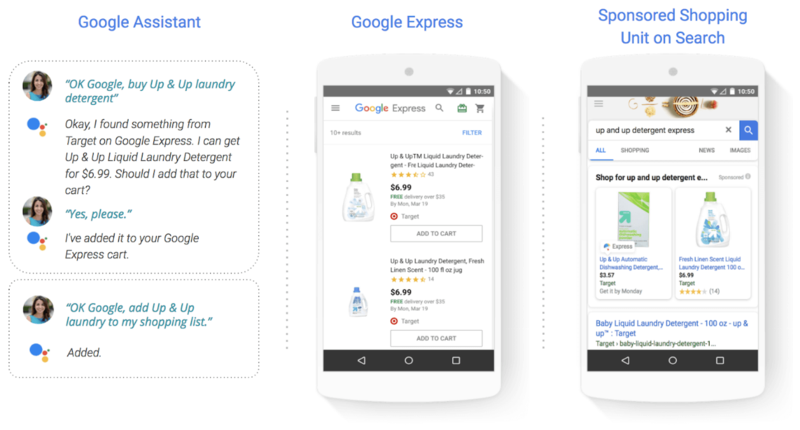 However, this may create further pricing wars among retailers partnering with Google Express. Similar products across competitive retailers will be aggregated for a consumer search, thus pricing will be a large part of the purchase decision. Co-op funding and initiatives will become more competitive as CPGs and manufacturers can bid to drive directly to a Google Shopping/Express experience. While Google will gain more conversion and path-to-purchase data with greater consumer adoption of Shopping Actions, retailers may become more reliant on Google for this data as consumers may be able to buy a brand’s product without ever visiting the brand or retailers site. For more information, visit the AdWords blog or contact Performics.